Passport Event Nov. 3 - Get your Tickets! Time to get your Passport Tickets! Passport 2018 is coming up fast! November 3, 1-5 PM. The Passport Event is November 3!!! This will be our fourth annual Passport event. Last year’s was a great success. The basics: Each participant pays $50 and receives a Passport which allows them to sample one special food item at each restaurant, along with the ability to purchase a special cocktail for $2. Proceeds will benefit Café 54 a non-profit restaurant training school. Café 54, a program of Coyote TaskForce, is a unique employment-training program for adults recovering from mental illnesses. Café trainees receive on-the-job training as cooks, pastry chefs, cashiers, and dishwashers. With the opportunities provided by Café 54, the trainees are on their way to independent employment in the community. 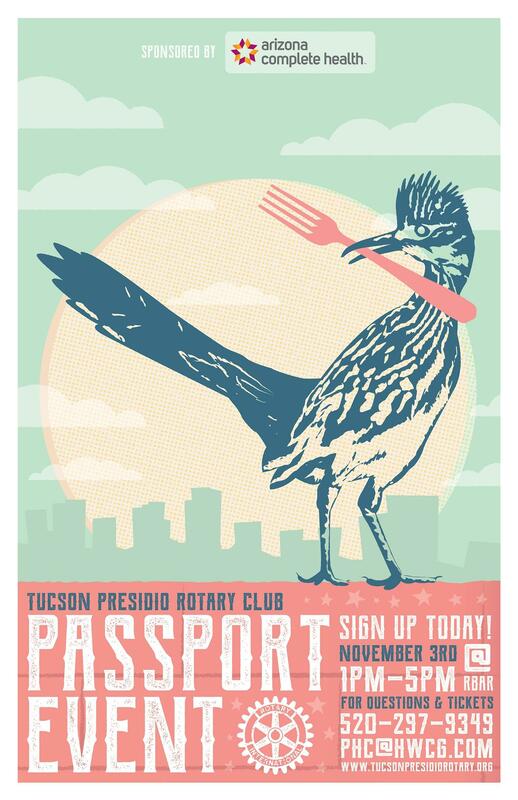 The PRESIDIO PASSPORT RAFFLE 2018 (the “Raffle”) will be held in conjunction with PRESIDIO PASSPORT 2018, a fundraising event to take place in downtown Tucson, Arizona from 1:00 pm to 5:00pm on November 3rd, 2018 (the “Event”). The Event’s sponsor is the Tucson Presidio Rotary Club/Rotary District 5500 (“Sponsor”). All proceeds of the Raffle will benefit the Tucson Presidio Rotary Club and their chosen causes. ELIGIBILITY: The Raffle is open only to citizens and legal residents of the 50 United States and the District of Columbia, who are 18 years of age or older as of November 3rd, 2018, and who possess a valid government-issued identification. Members of Sponsor are eligible to enter the Raffle and/or participate in the Event. There is no per-person limit on the number of Tickets or Passports that may be purchased, however, no more than 2,000 Tickets will be sold and no more than 250 Passports will be sold. All required information and fields on the entry form must be fully and accurately completed or entry may be voided. Refunds will not be issued. RANDOM DRAWING: On November 3rd, 2018, a winner will be selected in a random drawing from all eligible entries received (the “Winner”). Each Ticket sold constitutes an eligible entry. The odds of being the Winner depend on the total number of eligible entries received, which shall be no greater than one in 2,000. PRIZE: Subject to the provisions contained in this Agreement, Winner will receive a one-week stay for 2 adult and 2 children at The Mayan Palace, Mexico, subject to available vacancy, to be used by December 1st, 2019 (the “Prize”). No other elements or expenses are included in the Prize, and specifically excludes, among other elements and expenses: beverages, entertainment, travel insurance, unspecified ground transportation, rentals, phone calls, gratuities, incidentals, souvenirs, gasoline, all personal expenses of any kind or nature, together with any necessary overnight layover expenses, and all such expenses are the sole responsibility of the Winner. Any visa, travel, immigration, or vaccination requirements which the Winner is required to meet to use the Prize will be the sole responsibility of the Winner. Winner is responsible for scheduling reservations for the Prize and may also be responsible for taxes, additional tickets, or other expenses associated with booking the stay.